Asymmetric demand is demand that is specific to the client’s context-of-use. Intensifying competition for services that remain the same across different demand contexts increases the business potential for targeting asymmetric demand. Capturing this potential requires new forms of value proposition, and new levels of agility in the supporting infrastructures involved in their delivery. This not only involves taking power to the edge of an existing organisation, but also disrupting its present ways of doing business. 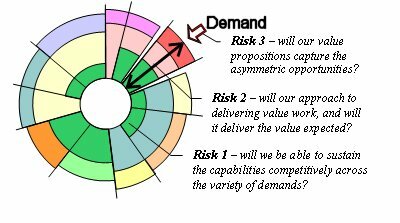 Strategic leadership therefore depends on being able to analyse and manage the demand-side risks of implementing new value propositions. The following five workbooks provide the meansof developing the value propositions appropriate to asymmetric forms of demand, defining the business models needed for their implementation, and evaluating the demand-side risks that arise as a consequence. How can the supplier have a greater impact on a client’s existing ways of creating value? How does a client’s value stairs organise its relationships with its suppliers? The outputs are the value propositions for adding value to the client’s business, their value to the supplying business, and the relationship development that these opportunities require. Action: develop new value propositions. Workbook 2: Targeting new forms of demand. In what new ways can demand be organised that will disrupt existing market organisation? What can the impact of this value ladder be on clients’ businesses, and how are the resulting opportunities to be targeted competitively? The outputs are value propositions with quantified growth and revenue characteristics, defined competitively within the context of a value ladder. What are the different ways in which the value proposition must target the asymmetric demand competitively, what are the targeting criteria for the resulting micro-segments, and how do they relate to existing industry segments? The outputs are the distinct forms of communication needed to target the micro-segments, and the targeting characteristics and sales potential of the micro-Segments. Action: target new client relationships. Action: create the performance accountabilities needed to deliver the value. Workbook 5: Defining the business model. The business model needed to compose the capabilities that support value propositions creates stratified value. What component products, services and capabilities need to be aligned across these strata, and how? The outputs are the attractiveness of the downstream opportunity being targeted, the amounts of demand and value being captured within the different strata, and the business inputs that need benchmarking. Action: set up the business model. Interoperability risk that a component service will not work as specified becomes an error of execution the failure of a planned action to be completed as specified. Orchestration risk that the component services will not work together as a whole as expected becomes an error of planning – the use of a wrong plan to achieve an aim. Composition risk that the proposition will not produce the effects expected becomes an error of intention – the supplier adopting an aim that is unwanted by the user. In order to create agility, the granularity of each layer needs to be defined in such a way that the strata can be composed as a whole to support the different forms of asymmetric demand – by ‘granularity’ is meant the functional differentiation available within any given layer. Thus supply-side dominance will seek to treat a system of systems as a more complex form of level 3 system, uncoupling supply-side from demand-side complexity. In contrast, demand-side dominance will require greater supply-side granularity, and a different demand-side commercial basis for providing agility. The different types of risk arise when gaps appear within and between the different strata – a ‘gap’ being a structural impediment to composition. ‘Split-screen analysis’ analyses the supply-side organisation of complexity, relating the supporting infrastructures to the variety of business models defined. The particular granularity of the strata can then be derived and analysed for gaps and misalignment. (iii) the available data views of the events and their outputs; and (iv) the synchronising processes of communication and integration. The gaps and misalignments in the way all these models fit together in relation to demand then define where there is a lack of agility. Action: manage the agility and granularity of the supporting business infrastructures to mitigate the risks.